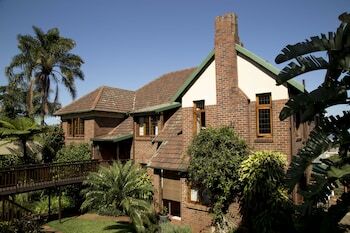 Located in Durban, Ridgeview Lodge is by the sea, within a 10-minute drive of Durban Botanical Gardens and Durban University of Technology. Featured amenities include express check-in, express check-out, and luggage storage. For a surcharge, guests may use a roundtrip airport shuttle (available 24 hours) and a train station pick-up service. When you stay at Happy Lands Self Catering/B&B in Addo, you'll be 11 minutes by car from Sir Percy Fitzpatrick Lookout. The front desk is staffed during limited hours. Located in Herolds Bay, Dragonfly Cottage is within a 15-minute drive of Diaz Beach and Redberry Farm. Free self parking is available onsite. With a stay at Azure House in Knysna (Paradise), you'll be within a 5-minute drive of Knysna Elephant Park and Knysna Quays. Knysna Luxury Homes offers accommodations throughout the area in Knysna. Free self parking is available onsite. With a stay at Oyster Shells in Umhlanga, you'll be a 1-minute walk from Umhlanga Lighthouse and 13 minutes by foot from Umhlanga Rocks Beach. Self parking (subject to charges) is available onsite. Located in Clarens, Andes Clarens Guesthouse is in a rural location, within a 10-minute drive of Clarens Brewery and Richard Rennie Art Gallery. With a stay at 4 Bella Casa Self catering in Langebaan, you'll be within a 10-minute drive of Langebaan Beach and Calypso Beach. Free self parking is available onsite.